US President Barack Obama and Republican rival Mitt Romney have made a series of lighthearted jabs at themselves and each other at the annual Al Smith charity dinner. At the event organized by the Catholic Archdiocese of New York, Barack Obama said his first debate performance – which he was judged to have lost – had been a “long nap” to prepare for the second. Mitt Romney mocked his own wealth. Referring to his Mormon faith. Mitt Romney said he had prepared for the debates by “not drinking alcohol for 65 years”. Earlier, Barack Obama made an appearance on the Daily Show with Jon Stewart. He said the US would “fix” security overseas after a deadly Libya attack. Jon Stewart asked Barack Obama about the administration’s “confused” response to the attack on a US consulate in Benghazi, Libya on 11 September. The US ambassador to Libya and three other Americans died in the attack, which remains at the centre of the campaign debate ahead of a foreign policy debate in Florida on Monday. Barack Obama told Jon Stewart his administration was still piecing together the evidence. “The government is a big operation. At any given time, something screws up and you make sure you find out what’s broken and you fix it,” he said. Barack Obama also repeated his wish to close the prison at Guantanamo Bay naval base in Cuba, a first term promise he has been criticized for not yet carrying out. The Alfred F. Smith Memorial Foundation Dinner – a traditional fixture on the presidential campaign calendar – was Mitt Romney’s only public event on Thursday after several campaign stops in Virginia the day before. Resplendent in formal white tie on stage, Mitt Romney – known for his business fortune – said that after a long campaign it was “nice finally to relax and wear what Ann and I wear around the house”. Barack Obama also noted he had been criticized for being too popular abroad at the beginning of his term. “I’m impressed with how well Governor Romney has avoided that problem,” he said, in a nod to a summer overseas trip that drew criticism. 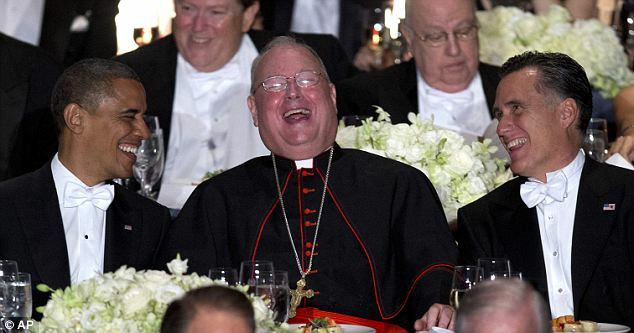 The dinner was overseen by Cardinal Timothy Dolan, the president of the US Conference of Catholic Bishops, which has clashed with the administration over contraception provisions in Barack Obama’s health care law. Cardinal Dolan has said he received “stacks of mail” protesting against Barack Obama’s invitation to the dinner, but he sought to avoid playing political favorites. The cardinal delivered benedictions at both the Republican and Democratic national conventions in 2012. Ahead of his reunion with Barack Obama, a daily Gallup tracking poll of likely voters suggested Mitt Romney had increased his lead nationally. However, a series of other polls show a much tighter race. Mitt Romney announced on Thursday that his campaign was leaving North Carolina, believing his victory was assured there. He is currently polling an average of six points ahead of Barack Obama in the state. Barack Obama also benefited from new polling on Thursday, with a Pew Hispanic Center poll suggesting three-quarters of Catholic Latinos back the president. The president picked up the backing of rock star Bruce Springsteen, as he did in 2008. Bruce Springsteen campaigned for Barack Obama on Thursday in Ohio with former President Bill Clinton. “For 30 years I’ve been writing about the distance between the American dream and American reality,” Bruce Springsteen said, reading from a statement.